This post illustrates the appropriate use of self-type to restrict the composition of (stackable) traits (mixins) in relation to an existing class or trait. Mixin traits with self-type restriction has commonly used in Scala. Dependency injection and the Cake pattern in particular, relies on constraint imposed by a trait that it can be used only with subclass of a predefined types. The same approach can be used to constraint a trait to be used with class that support one or several methods. Let's consider the case of a class taxonomy (or hierarchy) that classifies machine learning algorithms as either supervised learning or unsupervised learning. The support vector machine of type SVM is a type of supervised learning algorithm, and therefore extends theSupervisedLearning trait (line 5 & 115). The code snippet compiles because the class SVM (line 14) complies with the restriction imposed by the trait Validation on sub-types of SupervisedLearning (line 10). 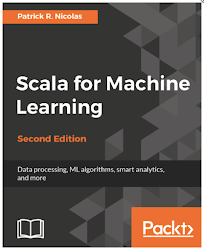 The Scala code snippet does not compile because the expectation-maximization algorithm, EM is an unsupervised learning algorithm and therefore is not a sub-class of SupervisedLearning. Marking a trait to be extended (implemented) with sub-class with predefined method(s) is the same as marking a trait to be extended (implemented) with sub-class with predefined type. Let's reuse the class hierarchy introduced in the previous section. As previously seen, the class SVM complies with the restriction imposed by the Validation. However the declaration of the reinforcement learning algorithm QLearning generated a compilation error because it does not implement the method train asd required. Although brief, this introduction to self-referential condition should help you to start considering this technique to protect you code from unintentional erroneous sub-typing and trait mixing.